Ministry of Labour and Employment has released All India Consumer Price Index for the month of September 2015. It has reached 266 which is two point increase over the previous month. Unlike penultimate DA Installment estimation, the pattern of Consumer Price Indices that are available for arriving at expected Dearness Allowances from January 2016 provides us precise idea on expected DA from January 2016. Hence, we thought of making a prediction analysis a bit earlier this time. In fact, the quantum of DA with effect from 1st January 2016, is very crucial for Central Government Employees and Pensioners, as it is going to determine the DA merged Pay and increase in allowances after implementation of 7th Pay Commission. As a first step let us list the Actual AICPI – IW which are available as on date, for estimating DA from January 2016. Out of 12 Consumer Price Indices which are required to determine DA with effect from January 2016, nine indices are already available. So, consumer price indices for remaining three months will have to be assumed. We have taken three possible assumptions this time, such that each assumption gives different quantum of increase in DA from January 2016. The least increase in DA from January 2016 will be 5% (i.e., DA from January will be 124% ). Under this assumption, DA from January 2016 will be 124% only if CPI falls below the present level of 266 in at least two of three coming months. Though Chances for this scenario coming to reality is possible but the increasing trend in consumer price index from February 2015 negates this possibility. DA from January 2016 is calculated to be 126%, only if CPI touches 272 from the present level of 266, at least two times in the coming three months with at least one point increase in the remaining month. We feel that this scenario is remotely possible considering the trend of CPI, which shows only moderate inflation. Steady increase in AICPI-IW could be found from February 2015 at the rate of one to two point increase over previous month. 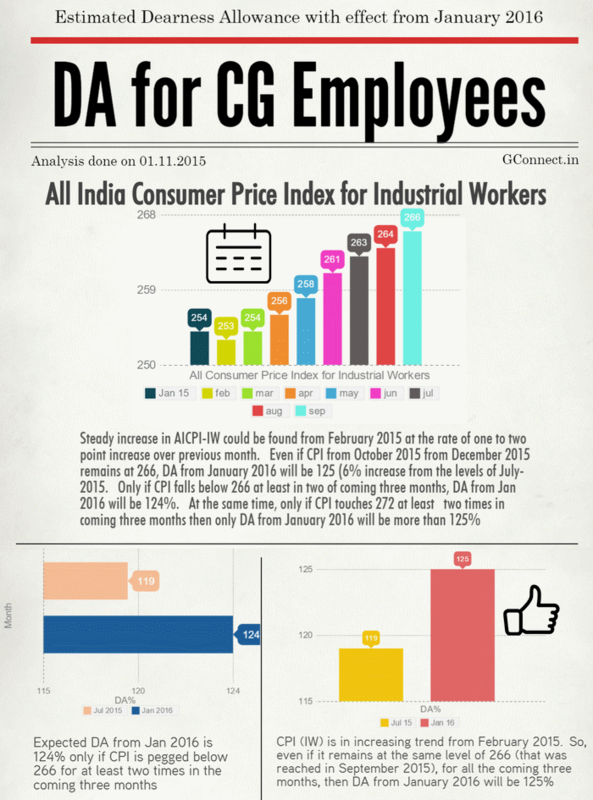 Even if CPI from October 2015 to December 2015 remains at 266 , DA from January 2016 will be 125%. Considering the trend in CPI in the recent months, it could be safely presumed that indices would increase one or two points in the coming months or at least remains in the same level. In both of these cases, DA from January 2016 will be 125%. It is apparent that Assumption 3 has got better chances out of these three assumptions. Hence we can safely bet that DA from January 2016 will be 125%. The following info-graphics would throw more light in this analysis. Income Tax Rebate for Deduction in respect of medical treatment, etc.